As a result of the November 29th announcement by Prime Minister Trudeau giving conditional approval to Kinder Morgan’s Trans Mountain Project, we have been receiving questions about what this might mean for whale species recognized to be at risk and protected under Canada’s Species at Risk Act (SARA). We have written the following in order to answer these questions related to the potential increase in tanker traffic and whale species at risk by summarizing available information from federal documents including Recovery Strategies and Action Plans. In addition to this review of federal documents, MERS research on Humpback Whales and the risk of vessel strike is pertinent to the potential of increased tanker traffic. Our extensive experience with Humpback Whales provides us with the knowledge of how incredibly unaware Humpbacks can be of boats and how very unpredictably they can surface. This has made our “See a Blow? Go Slow!“campaign a necessity to raise awareness about reducing the risk of collision for the sake of whale and boater safety. Our work with Humpback Whales makes us all too aware that large vessels like tankers cannot divert course fast enough to avoid hitting humpbacks. The more vessel traffic, the greater the risk becomes. What are the specifics of the tankers – size, number and route? The Aframax tankers proposed to serve the pipeline are 245 m long and 42 m wide. There would be an approximate sevenfold increase in the number of tankers – from 60 to 408 tankers annually. The tankers would carry diluted bitumen to Asian and Californian refineries along the route in the figure below. Note that tanker route (red line) is shown relative to acknowledged critical habitat for the endangered southern resident killer whale population (purple area). Figure 1: Red line is the tanker route. Purple area is acknowledged critical habitat for the endangered Southern Resident Killer Whale population. Click to enlarge. Source: Wilderness Committee. How important is the tanker route area to whale species at risk? The following whale species are recognized to be at risk and are commonly present along the tanker route. They are protected under Canada’s Species at Risk Act. In addition to the designated critical habitat (see Figure 4) there has been a recent dramatic increase in humpbacks in the Strait of Georgia and the Juan de Fuca Strait. You will note that the area through which increased numbers of tankers would transit is designated or proposed critical habitat for all three at-risk whale species. Figure 2: “Critical habitat for Southern Resident Killer Whales. The hatched area in US waters shows the approximate areas designated as Southern Resident critical habitat under the US Endangered Species Act (ESA).” Source: Recovery Strategy for the Northern and Southern Resident Killer Whales (Orcinus orca) in Canada. Figure 3: “Map showing the habitat considered necessary for meeting recovery objectives for inner coast WCT Killer Whales [West Coast Transient]. Area includes marine waters bounded by a distance of 3 nautical miles (5.56 km) from the nearest shore. This area includes the locations of over 90% of all individual identifications and predation events documented in BC waters during 1990-2011.” Source: Information in Support of the Identification of Critical Habitat for Transient Killer Whales (Orcinus orca) off the West Coast of Canada. Figure 4: “Locations of the four critical habitat areas [for Humpback Whales]: a. Southeast Moresby Island, b. Langara Island, c. Southwest Vancouver Island, d. Gil Island (DFO 2009). The existence of other areas of critical habitat for Humpback Whales in B.C. is likely.” Source: Recovery Strategy for the North Pacific Humpback Whale (Megaptera novaeangliae) in Canada. What risks are associated with increased tanker traffic? 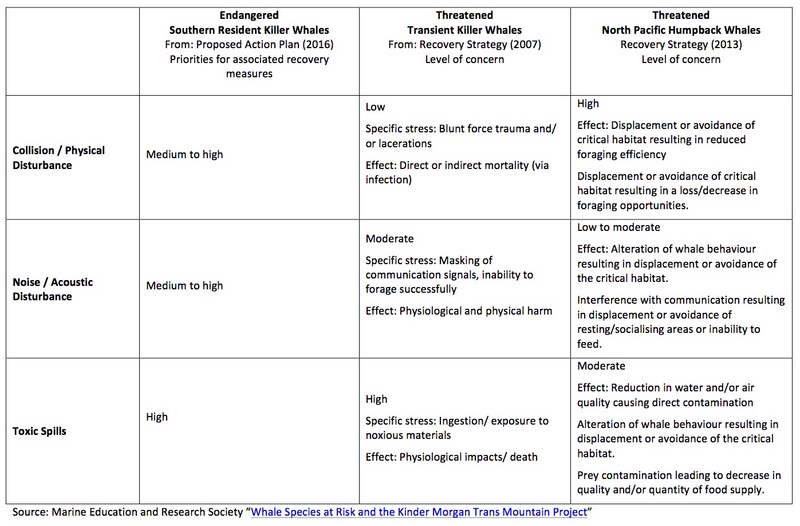 Below, we have summarized associated risks as specified in the SARA Recovery Strategies or Action Plans for whale species at risk (click to enlarge). Figure 5: Summary of risks associated with tankers as specified in the SARA Recovery Strategies or Action Plans for whale species at risk. Click to enlarge. Resident Killer Whale Recovery Strategy (2011): “The threat of a spill of oil or other toxic material within the areas of critical habitat pose not only an immediate and acute risk to the health of resident populations . . . but have the potential to make critical habitat areas un-inhabitable for an extended period of time. . . . While the probability of either northern or southern resident killer whales being exposed to an oil spill is low, the impact of such an event is potentially catastrophic [Note that this Recovery Strategy dates back to 2011]. Both populations are at risk of an oil spill because of the large volume of tanker traffic that travels in and out of Puget Sound and the Strait of Georgia (Baird 2001, Grant and Ross 2002) and the proposed expansion of tanker traffic in the north and central coast of BC. In 2003, 746 tankers and barges transported over 55 billion litres of oil and fuel through the Puget Sound (WDOE 2004). If the moratorium on oil and gas exploration and development is lifted in British Columbia, the extraction and transport of oil may put northern resident killer whales at additional risk. [Note the Recovery Strategy was finalized prior to the announcement rejecting the Northern Gateway Project and developments with the Kinder Morgan Trans Mountain Project]. Humpback Whale Recovery Strategy (2013): “The recent oil platform blowout in the Gulf of Mexico released an estimated 5.2 million barrels of oil (Crone and Tolstoy, 2010) is a poignant reminder of the potential for failure in engineered infrastructure in the marine environment. Even with very low odds and excellent safety records, catastrophic events can lead to undesirable outcomes. Proposed pipeline projects, associated tanker traffic, and possible offshore oil and gas exploration and development in coastal British Columbia all increase the likelihood of toxic spills in Humpback Whale habitat in the future, and underscore the importance of protecting critical habitat and supporting mitigation measures and plans. In 1989 and 1990, following the Exxon Valdez oil spill, Humpback Whales in Prince William Sound were monitored for resulting effects. A change in abundance could not be determined, no change in calving rate was observed, and distribution varied by year, possibly related to changing prey abundance or distribution. Since there were no reports of Humpback Whales directly exposed to the spill (i.e. swimming through oil slicks), or of dead stranded whales (Dahlheim and von Ziegesar 1993), it is difficult to conclude whether Humpback Whales are vulnerable to oil spills or whether there were simply no whales in the vicinity at the time of the spill. However, other cetaceans such as Killer Whales do not appear to avoid toxic spills, and the Exxon Valdez oil spill was associated with unprecedented mortality of both Resident and Transient Killer Whales, likely resulting from inhalation of petroleum vapours (Matkin et al. 2008). Toxic spills have occurred impacting marine habitat along the B.C. coast. For example, the Nestucca oil spill (1988) resulted in 875 tonnes of oil spilled in Gray’s Harbor, Washington. Oil slicks from this spill drifted into Canadian waters, including Humpback Whale habitat. In 2006, a tanker ruptured in Howe Sound, B.C. spilling approximately 50 tonnes of bunker fuel into coastal waters. In 2007, a barge carrying vehicles and forestry equipment sank near the Robson Bight-Michael Bigg Ecological Reserve within the critical habitat for Northern Resident Killer Whales, spilling an estimated 200 litres of fuel. The barge and equipment (including a 10,000L diesel tank) were recovered without incident. When the Queen of the North sank on March 22, 2006, with 225,000 L of diesel fuel, 15,000 L of light oil, 3,200 L of hydraulic fluid, and 3,200 of stern tube oil, it did so on the tanker route to Kitimat, which is currently the subject of a pipeline and port proposal and within the current boundaries of Humpback Whale critical habitat . . .
Strong avoidance reactions to underwater noise by Grey, Humpback and Bowhead Whales has been observed at received levels of 160-170 dB re 1 µPa (Richardson et al. 1995; Frankel and Clark 2000; McCauley et al. 2000; Stone and Tasker 2006). The level of noise from a tanker may be as high as 190 dB re 1 µPa, and bathymetric features that reduce sound dissipation would further increase the level of disturbance. For this reason, fjords or channels may be particularly sensitive to noise propagation from vessel traffic. The disruption of access to these areas would limit or reduce foraging opportunities or alter behaviours that support other life processes, such as resting, socializing, and vocal interaction. What mitigation measures has the federal government put forward? On November 7th, the federal government announced the “Ocean Protection Plan” for which “Canada will invest $1.5 billion over five years in long-needed coastal protections, with an action plan to deliver results for the coming decade. This Plan will engage communities, first responders, and governing authorities to work together effectively to respond to emergencies.” Many details have not yet been released. Oil spills: “The Government of Canada will fund improved research capacity to seek safe, reliable, and more effective technologies to clean up oil spills. Research into new clean-up technologies is an essential part of a world-leading marine safety plan. Fisheries and Oceans Canada. 2011. Recovery Strategy for the Northern and Southern Resident Killer Whales (Orcinus orca) in Canada. Species at Risk Act Recovery Strategy Series, Fisheries & Oceans Canada, Ottawa, ix + 80 pp. Fisheries and Oceans Canada. 2016. Action Plan for the Northern and Southern Resident Killer Whale (Orcinus orca) in Canada [Proposed]. Species at Risk Act Action Plan Series. Fisheries and Oceans Canada, Ottawa. iii + 32 pp. Ford, J.K.B, E.H. Stredulinsky, J.R. Towers and G.M. Ellis. 2013. Information in Support of the Identification of Critical Habitat for Transient Killer Whales (Orcinus orca) off the West Coast of Canada. DFO Can. Sci. Advis. Sec. Res. Doc. 2012/155. iv + 46 p.
Two Months and Two Humpbacks Entangled at the Same Location – What Can We Learn? Note, this blog was initially written to answer questions about the two Humpbacks entangled at the same site in 2016 – the Sheep Passage open-net farm site near Klemtu. One whale was freed on September 12th (survival unknown) and one died at the same site on November 15th, 2016. We are striving to update this blog with related information as it becomes available. UPDATE December 6, 2018: Humpback found in the Cermaq’s Millar Channel farm. From media provided by Cermaq “The cage was empty and did not contain any salmon and the whale was in good health, not entangled and not exhibiting signs of stress”. Plan for release of the whale was coordinated by DFO. ID of the whale is not known to date and it is unknown how the whale entered the nets..
UPDATE January 1, 2017: New Regulation went into effect requiring any fishery/aquaculture exports to the U.S. to meet equivalent standards of the Marine Mammal Protection Act for monitoring and bycatch mitigation. There is a 5-year exemption period (to January 10, 2022). 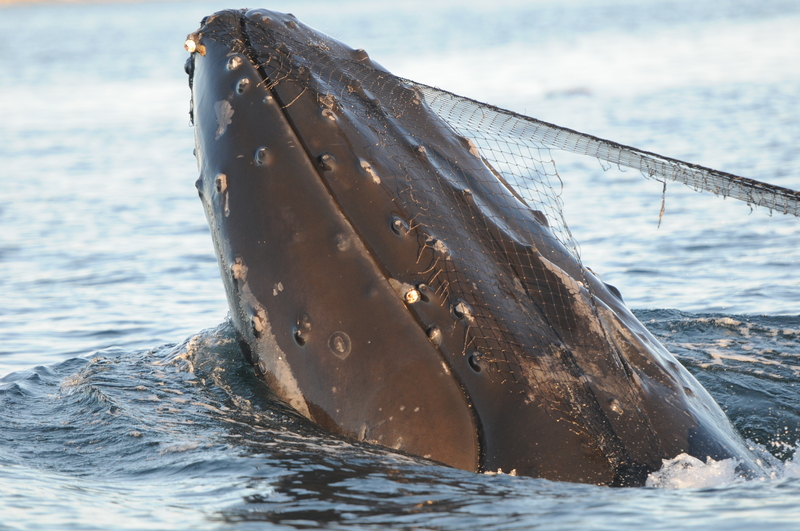 UPDATE November 29, 2016: Another Humpback Whale has died in open-net fish farm gear. This whale was at the Grieg Seafood’s Atrevida farm in Nootka Sound. This is the 2nd Humpback Whale dead at a fish farm in two weeks and the 3rd that is known to have been entangled in fish farm gear in 2.5 months. See this link for further information. December 2, 2018 – Cermaq’s Millar Channel farm. Whale reported to be within the farm but not entangled nor injured. Plan for release of the whale was coordinated by DFO. ID of the whale is not known to date and it is unknown how the whale entered the farm. November 29, 2016 – Grieg Seafood’s Atrevida farm in Nootka Sound. Humpback found dead in nets. Necropsy results unknown. ID of dead whale not known. November 15, 2016 – Marine Harvest’s fallow Sheep Passage open-net farm site near Klemtu. Humpback found entangled and dead. This is the same site as the entanglement of September 12, 2016. ID of whale not known. Related media: See end of blog. September 15, 2016 – Marine Harvest’s fallow Sheep Passage open-net farm site near Klemtu. Humpback found entangled and was professionally disentangled. ID of whale not known. Survival not known. Media: See end of blog. March 27, 2013 – Mainstream Canada’s Ross Pass farm. Humpback dead. Necropsy inconclusive if whale was dead before or after becoming entangled in fish farm gear. As a result of our research to understand and reduce risk of entanglement for Humpbacks and our efforts to increase awareness about what to do if an entanglement is witnessed, we’ve been getting a lot of questions about the latest known Humpback entanglement on BC’s Central Coast. Many of the questions were generated by Marine Harvest’s November 17th, 2016 release “Whale found dead at empty aquaculture site”. For the sake of efficiency and awareness raising, we’ve strived to answer the questions below and will update this information as we learn more. Our aim is to help ensure that what is learned from entanglements leads to measures that reduce the risk. 1. Was the November 15th entanglement at the same site as the September 12th entanglement? Marine Harvest has reported that both whales were entangled on the same anchor system at the fallow Sheep Passage open-net farm site near Klemtu. 2. Why was the anchor system not removed? The latest entanglement is under investigation by Fisheries and Ocean’s Canada (DFO). We are striving to find out if the results will be made public and if the results may inform policy and regulations around open-net fish farm anchor systems. 3. Did the whale entangled at this site on September 12th survive? The Humpback caught up in the same anchor system on September 12th was disentangled by those with training (disentanglement must be coordinated by DFO and done by those with training, see #9 below). This was a very complex entanglement (see photo and video below) but all gear was successfully removed from the whale. It is not possible however to definitively say that the whale survived the injuries as there have been no documented re-sightings. 4. How did the whale found on November 15th die? Whales are mammals and therefore need to come to the surface to breathe. They will drown if they are anchored to the bottom because of being trapped in ropes or fishing gear. It is hoped that the DFO investigation will provide insight into the specifics of this anchor system and how the Humpback died. Wherever there are lines or fishing gear in the ocean, there is the potential for entanglement, especially in areas where Humpbacks are feeding. They feed on krill and small schooling fish like herring and it can be expected that these prey are in the same areas as open-net fish farms. It is essential to realize that Humpbacks do not have the biosonar that toothed whales like Orca have and they can be extremely oblivious of boats, let alone fishing gear. Also note that if whales have enough mobility to swim away, entanglement also can also cause death due to the fishing gear in which they are wrapped leading to serious injuries and infections, and/or because the gear makes it impossible for them to travel and feed effectively. 5. How often to whales die from entanglement on BC’s coast? Preliminary research conducted by the Marine Education and Research Society and DFO supports that 47% of Humpbacks have scarring on their tailstocks that indicate that they have been entangled and survived, i.e. almost one in two Humpbacks that feed on BC’s coast have been entangled at some point in their lives (>1,000 Humpbacks). This indicates how widespread the risk of entanglement is, but does not indicate how many Humpbacks die due to entanglement. Dead whales most often sink to the ocean bottom whereby their deaths cannot be documented. If their bodies do wash ashore on BC’s vast coastline, often they are so decayed that cause of death cannot be determined. 6. Have there only been two Humpback Whales entangled in Marine Harvest open-net salmon farms in the last 30 years? Yes, specifically at Marine Harvest farms, and specifically for this marine mammal species, there have been two reported cases of Humpback entanglement. There was another documented case of a dead Humpback Whale at an open net fish farm in March 2013 near Tofino at a Mainstream Canada site (now Cermaq). The statement regarding “30 years” in “Whale found dead at empty aquaculture site” must be weighted out against the reality that Humpbacks were extremely rare on BC’s coast even 15 years ago. Humpbacks were whaled in BC waters up to 1966. To give an indication of how Humpback numbers have increased since then, our research shows that in the islands outside Telegraph Cove on NE Vancouver Island alone, we documented just 7 Humpbacks in 2004 and, this year to date, we have documented 83 individuals (some just passing through). The population estimate for Humpbacks feeding in BC waters is at least 2,000 individuals. With more Humpbacks, there is more risk of entanglement. 7. Are there regulations around the gear left at fallow fish farms? No, there are not. It is hoped this will be an outcome of what is learned from these entanglements. See #10 below for what regulations do pertain to aquaculture and marine mammals. 8. Is the ID of the dead Humpback known? No, it is not known. It is hoped that as part of the investigation, Humpback researchers like ourselves may be able to be of use in trying to identify who this whale was. 9. What should be done if someone witnesses an entanglement? • With great urgency, report the entanglement with location to the DFO Incident Line / VHF 16. 1-800-465-4336. • Take whatever video/photos are possible but maintain a distance that doesn’t stress the whale (at least 100 metres). • Do NOT attempt to remove any fishing gear or rope from the whale as it risks human and whale safety (has led to human death). Professional training and equipment are needed to assess the entanglement and proceed safely with the greatest chance of success. Often, much of the fishing gear in which the whale is entangled is not visible at the surface. If well-intentioned members of the public remove the gear at the surface, it is made much more difficult to: (1) recognize that the whale is entangled; and (2) disentangle the whale even if it is relocated. Trailing gear at the surface provides the opportunity for trained responders to attach a tag to track the whale and/or to attach floatation to maintain contact with and slow down an entangled whale. Loss of this gear can significantly reduce rescuers’ ability to save the whale. For more information regarding reducing the risk of vessel strike and entanglement, see www.SeeABlowGoSlow.org. 10. What regulations are there around reporting and reducing the risk of entanglement at finfish aquaculture sites? Section 102 (c)(3) of the MMPA states that it is unlawful to import into the United States any fish, whether fresh, frozen, or otherwise prepared, if such fish was caught in a manner which the Secretary of Commerce (Secretary) has proscribed for persons subject to the jurisdiction of the United States, whether or not any marine mammals were in fact taken incident to the catching of the fish. (16 U.S.C. 1372(c)(3)). Contact information: For further information regarding the work of MERS to understand the risk of entanglement to Humpbacks: Email info@mersociety.org. Phone 250-956-3525 or 250-230-7136. Are humpback whales threatened in BC? For the past decade MERS has conducted research on humpback whales in the waters off northern Vancouver Island. With the help of fellow north island researchers, community members, and ecotourism companies, especially Stubbs Island Whale Watching and Seasmoke Whale Watching, we have been documenting the return of humpback whales to these waters following the end of commercial whaling. In 2003 we only documented 7 humpback whales in these waters, but by 2011 there were 71. We have learned that the majority of individuals consistently return to these waters each year to feed between spring and fall. It is likely that this area is critical to the survival of these whales. 12-year-old humpback whale “KC” (BCY0291), breaching. KC was first documented by MERS researchers off northern Vancouver Island when he was a calf in 2002, and has returned to the area every year since then. The waters off Vancouver Island are also busy with vessel traffic and commercial fishing activity between spring and fall. Since 2009 we have documented 5 incidents where humpback whales were entangled in fishing gear and since 2006 have documented 8 cases where humpbacks whales were struck by vessels in this small area alone. Efforts to rescue entangled animals or respond to vessel strike reports by MERS, Cetus and DFO have helped save the lives of some of these whales but an unknown number of individuals die each year from these threats. Preliminary results from MERS research reveal that over 30% of humpbacks off BC have scars indicating that they have been entangled at some point in their lives. Research by DFO has identified other areas of the BC coast that are also critical to the survival of humpback whales. Very little is known about the severity of the anthropogenic threats that humpback whales face in these waters but it can be inferred that threats are most prominent in areas where human activity is highest. In this regard at least two things are worth noting. 1. The Strait of Georgia was historically important humpback whale habitat. Over 200 humpback whales were killed in the Strait of Georgia between 1868 and 1907. Today, this area is one of the busiest waterways off the west coast of North America and humpback whales have only just begun to show the first signs of recovery in these waters with a few individuals spotted each year. 2. Caamano Sound, Squally Channel, and the entrance to Douglas Channel have been defined as Critical Habitat (see the North Pacific Humpback Whale Recovery Strategy) due to the high numbers of humpbacks that use these waters. This area is on the proposed Northern Gateway tanker traffic route. If the federal government approves this project, vessel traffic will increase significantly in these waters in the coming years. Humpback whale “Slash” (BCY0177), an adult female who has had at least two calves, with scars from a collision with a large vessel. The recent proposed decision by the federal government to down-list BC’s humpback whales from Threatened to Special Concern means that the humpbacks will not be afforded their current level of protection from anthropogenic threats both within and beyond Critical Habitat. The recommendation to down-list BC’s humpbacks comes from the Committee on the Status of Endangered Wildlife in Canada (COSEWIC) – a body that operates independent of government. Following protocol, their recommendation was based on the science available, yet some argue that there are significant knowledge gaps regarding the population structure of BC’s humpbacks and the threats they face. If BC’s humpbacks are indeed down-listed, this means that fewer dollars will be allocated to studying the threats to this population, how threats can be mitigated, and if genetically distinct populations exist within BC. If you want to share your opinion on the federal government’s decision to down-list the humpback whale in BC please consider letting them know your thoughts through the public consultation period, open until May 17th. Please also consider supporting MERS’s continued research on understanding and mitigating threats to this species. In 2014, we will continue to respond to cetacean entanglement and vessel strike reports in central and southern BC, operating cooperatively with DFO but with the understanding that their resources will become even more limited with the recent proposal to down-list humpbacks. As the days begin to shorten, the waters off northeastern Vancouver Island team with activity as every animal is trying to get in their catch before the season is over. While using this opportunity to collect some data on the feeding activity of humpback whales yesterday, I came across a group of three whales that we at MERS know very well – Twister, Cutter, and Corporal. They were all tightly grouped and moving fast, seemingly panicked. I had a closer look through binoculars and was able to see the source of the panic – Cutter had ripped through a seine net and had it wrapped around his head and body. Interestingly, one of Cutter’s companions, Twister, already has a history with fishing gear. In a period of less than 3 weeks in 2009 he became entangled twice. Both times, the fishermen who set the gear reported the incident immediately, and trained responders from DFO were able to free the whale. As was the case with Twister, a quick response provides the best chance of survival, so having been involved with the rescues of several entangled whales both in BC and in the Atlantic, I alerted the authorities and carefully moved in for a closer look. The net on Cutter’s head was attached by barnacles and tubercles on his lower jaw. Cutter was staying close to the surface and lifting his head high in the air allowing me to confirm with photographs that the net was just caught on the barnacles and tubercles of his bottom jaw. With the help of DFO and using standard disentanglement techniques including a long pole, lines, and flotation the net was grabbed onto and once tension was applied, Cutter tossed his head back and the 60-foot swath of net came off. Within seconds Cutter went on a long dive, followed by Twister and Corporal. When Cutter surfaced again, he was alone but was relaxed and swimming slowly. This afternoon, we found Cutter looking healthy and behaving normally, feeding along with 3 other whales only a few miles from where I saw him yesterday. This situation is a reminder that with the return of humpback whales to the coast of BC, there is increasing overlap between whales and fisheries. This is a difficult situation for both parties, as entanglements can lead to injuries and deaths for whales, and loss of catch and gear for fishermen. MERS has been studying the threat of entanglement since 2010, and has found that a significant number of the whales we have documented show scars from previous entanglements. If you see an entangled whale, call DFO’s Marine Mammal Incident Reporting Hotline immediately at 1-800-465-4336. If possible, standby the whale until trained responders arrive, but do not touch the whale or the entangling gear. To learn about MERS’ education and research projects, check out our website at www.mersociety.org. Please also consider liking us on facebook, following this blog and/or making a donation now. How important are herring to humpback whales? Each spring, humpback whales in the eastern North Pacific Ocean travel from warm waters off Hawaii or Mexico up to the cooler, temperate waters off B.C. and Alaska. What brings them back up here is food; the tropical and sub-tropical areas where humpback whales mate and give birth during winter have very little food for whales, so humpbacks must obtain almost all the energy they need for a year’s worth of activity while they are in our cold, rich waters during the summer and fall. Humpbacks feed on krill (small crustaceans), as well as small, schooling fish such as herring and sandlance. Off B.C., however, it is not yet known how important different prey species are to humpbacks, or to what extent individual humpback whales may specialize on specific foraging locations and prey types. In eastern Queen Charlotte Strait, herring congregate in dense schools, locally known as “bait balls”, during the late summer and fall. Humpback whales in this area appear to specialize on herring during this time, targeting bait balls and lunge-feeding on them. As part of my Master’s research through Simon Fraser University, I am working on estimating how much of humpback whales’ energetic requirements are obtained from feeding on these herring. To help answer these questions, I need to estimate how often humpback whales are feeding on herring, and how much herring they consume each time they feed. To predict how often humpback whales are feeding, I first identify a whale as an individual, and then watch it for an hour and record each time that it feeds and what type of prey it eats (tracking animal behaviour in this way is called “focal following”). To figure out how much herring they eat during each feeding event, I have been taking underwater video of herring bait balls. By also measuring the size of the herring in the bait ball, I can use their actual size, compared with their size on the video, to estimate the dimensions and therefore the volume of the bait balls. By combining the results of the focal follows and bait ball videos with an energetic model for humpback whales, I can predict what proportion of the energy requirements of these humpbacks are provided by the herring bait balls that they are feeding on. The results of my research will have implications for managing humpback whale populations. Although human impacts such as overfishing and habitat degradation may not be sufficient to affect humpback whale prey species at the population level, they may cause depletion of these species on a local scale. It is not yet understood whether B.C. humpback whales have the ability to easily switch to a different prey source and foraging location if availability of their preferred prey declines, so it is possible that local prey depletion may have impacts on humpback whales that feed in B.C. This summer will be my second field season of gathering the information that I need to estimate how important these herring are to humpback whales in eastern Queen Charlotte Strait. Huge thanks to everyone who has helped out with and supported this study so far, especially Stacey Hrushowy, Jared Towers, and Jackie Hildering. Click here to learn more about MERS humpback whale research, or here to donate to MERS’ work. Also, please feel free to e-mail me at mersociety@gmail.com with any questions.